The Pirates traded Eric Hinske to the Yankees today for two minor league prospects, outfielder/catcher Eric Fryer and RHP Casey Erickson. Indianapolis outfielder Garrett Jones will take Hinske's spot on the roster. Fryer was hitting .250 with 11 doubles for Class-A Tampa. He will be assigned to Lynchburg. Erickson is 3-3 with a 2.25 ERA for Single-A Charleston. He has an impressive 33 K's in 32 2/3 innings pitched. He most likely will be heading to the West Virgina Power. Looks like we got something in return for basically nothing. Why was Hinske on this team to begin with? 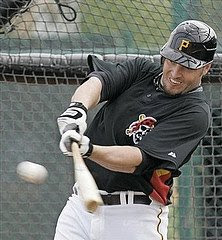 The former AL Rookie Of The Year was hitting .250 with only 1 HR and 11 RBIs for the Bucs. Bringing up Jones is an improvement. Jones was hitting .307 with 18 doubles, 12 HRs, 48 RBIs and 14 stolen bases for Indy. Good things are happening my friends. Just another trade that will help the Pirates out in the future, and that's what we are waiting for. The future is not far away.